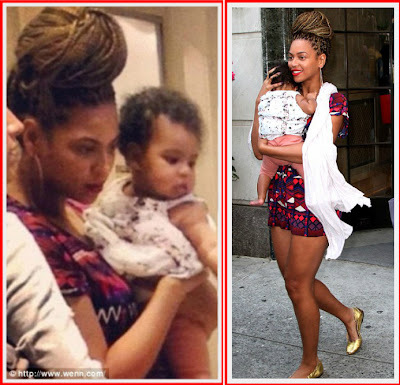 Yimiton's Blog: See Baby Blue Ivy's face, she looks so much like JayZ! 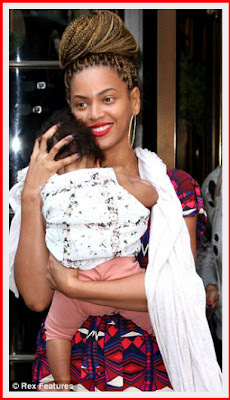 See Baby Blue Ivy's face, she looks so much like JayZ! What do you think of Beyonce's new hairdo? I think she looks really nice and much younger in her braids than her regular human hair. Her baby is so adorable, plus I totally see Jayz's face on her. What part of her face exactly looks like Jay-Z's? I don't see it. Lucky child. 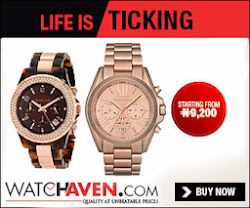 She's born into wealth. So, why exactly have they been hiding her face behind hoods? I was beginning to think they have something to hide. This baby will soon be too big for Beyonce to carry. She's pretty. Looks more like her mom to me. Shes pretty i feel bad for her though never gonna have a normal life and then be forced into a certain way of thinking.